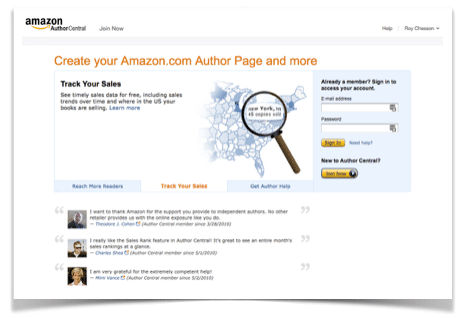 Using Amazon Author Central and creating an Author page can make a big difference in your book sales. It not only proves your legitimacy as an author but gives you certain functions and capabilities on Amazon that will help to convert readers into fans. 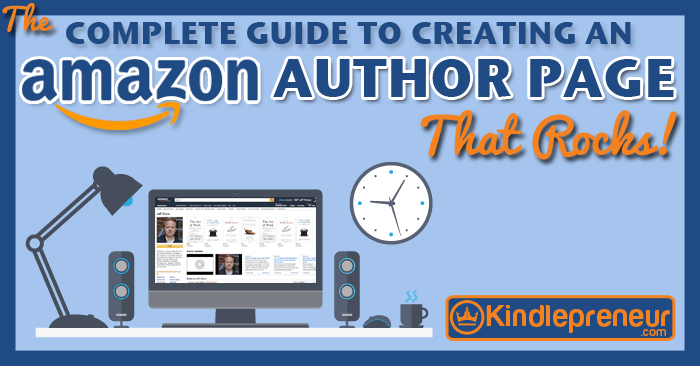 Sadly, creating a professional Amazon Author page can feel daunting with all the different steps. But don’t worry because I’m about to show you step-by-step how you can create an amazing Author Central page, and even some super effective tactics to help boost your sales and follower numbers. How to add the most awesome features to your Page that most don’t know about! 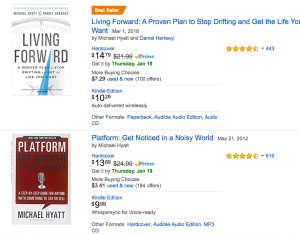 An example of a stellar author’s page…that we got to help create – Michael Hyatt! Bonus: Download Dave’s free printable checklist with each step to creating your Amazon Author Page here! 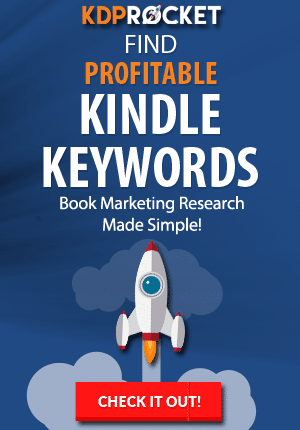 Many authors will setup their Kindle Direct Publishing (KDP) account and publish their book. However, they’ll forget to setup an account on Amazon Author Central. 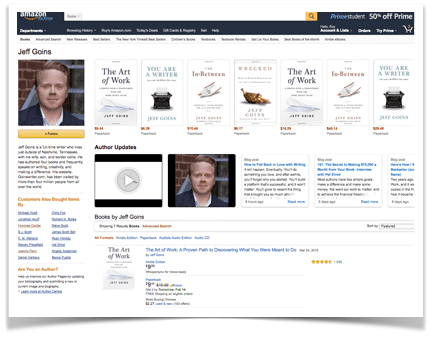 So, what is Amazon Author Central and what does it do? Add the Editorial Reviews section for your book – WHICH IS SUPER CRITICAL! Anyone with a book listed on Amazon can sign up for an Author Central Amazon account, and in order to take advantage of creating your Author Page, you’re going to need one. An Amazon Author Page is like your personal feature page on Amazon. It’s where people can learn more about you, see (and buy) all your books, and find your website, blog, or social media all in one spot on Amazon. It’s basically an extension of your author platform, which you’re probably trying to build. This is crucial because it will not only help you to sell more books by grouping them all on one page for your fans to find, it also helps build your legitimacy as an author and help your fans connect with you in more places. If you aren’t familiar with Author Pages, go to Amazon now and type in a random book title. When you look at a book on Amazon, the author’s name is below the title. 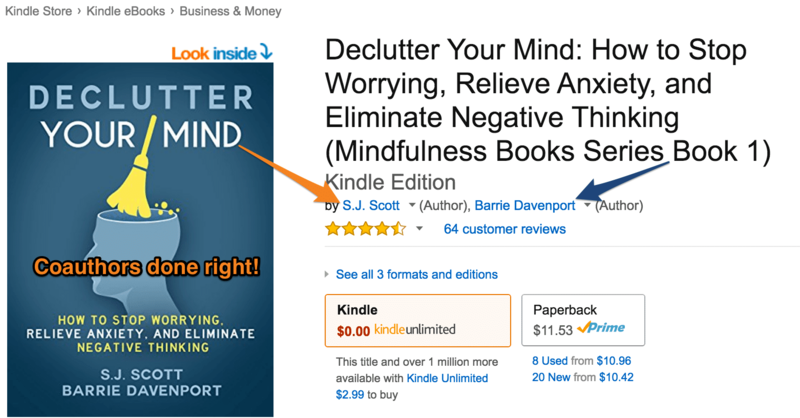 If it is hyperlinked, or a link you can click on, you can click to see the Author’s Amazon Page. Here is a peek at Jeff Goins’ author page, the master on how to write a book – and don’t worry, I’ll show you how to set one up that looks just like it! The great news is, it’s super simple to create an Author Central account and a professional Author Page that will help turn potential readers into your lifelong fans. So, in order to get you started, let’s first create an Amazon Author Central account. First, you’ll need to sign up for an Author Central account before you can make your Author Page. You must have a book for sale on Amazon to get an Author Central sales account. 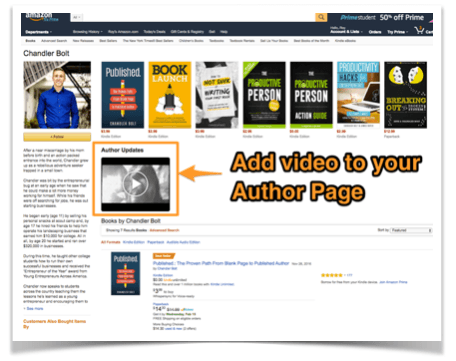 If you already have an Author Central Amazon account, you get a free pass to Step 2 – setting up your Author Page. If you don’t have an Author Central account yet, here’s how to do it. Sign in with your regular Amazon username and password. If you don’t have an account, select I am a new customer. You’ll need to give a little more information. Read the Terms and Conditions then click Accept. Enter the name your books are written under. A list of possible books appears. Select any one of your books to create the account. If your book is not in the list, you can search for it by title or ISBN. Your book must be available for purchase on Amazon in order to setup an Author Central Amazon Account. Amazon will send you a confirmation email to finish creating the account. Amazon may contact your publisher(s) as an additional measure to verify your identify, which may take three to seven days. While you’re waiting for verification, you can start adding information to your Author Page. You cannot add or make changes to your books or blog until your identity is confirmed, but don’t let that stop you from getting started. You can start adding things like pictures and a bio right away. Your Author Page is an extension of your author platform. You should update it with your new books, photos, courses, or videos as you create them. Tell potential readers about yourself. You hopefully already have an author bio crafted with carefully selected keywords you want connected to you and your books. Consider including interesting facts about your background, awards, hobbies, proud projects, and things that legitimatize you as an author and connect you with readers. Your bio should also mention where people can find you on social media and your website or blog. K.M. 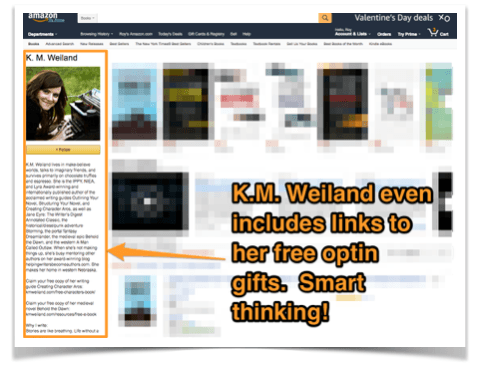 Weiland even has links to her free opt in gifts in her bio! Click Preview biography to review your work, then click Save biography. You can type directly in Amazon Central, but it’s best practice to have your own copy of the information saved. So type it in Word, Evernote, or some other tool first, then copy and paste it into your profile on Amazon. You’ll need to keep it plain text (no fancy bold, italics, HTML…) and make it at least 100 characters to meet Amazon’s requirements. Show potential readers who you are – a real and interesting person who writes books. Some authors include one professional author headshot, while others include a variety of professional and personal pictures. You might add a picture of your family if that will resonate with your target audience, or add a picture of you speaking if you’re a professional speaker. Click Browse and select a picture. Click the box to confirm you own or have cleared all rights to the photo you are adding, and then click Upload photo. 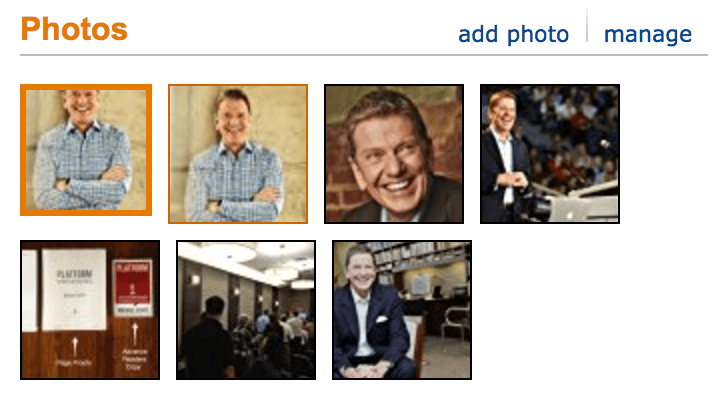 You can change the order of photos by clicking Manage and dragging the photo to your desired location. You can show teasers of your latest blog feeds by connecting your blog to your Page on Author Central. 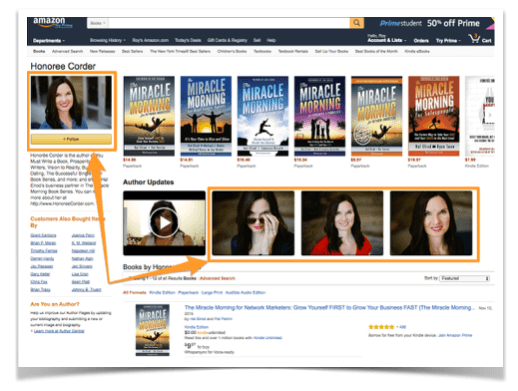 When you add something to your blog, it will automatically update on your Amazon page. This should increase traffic to your blog and keep readers connected to you. 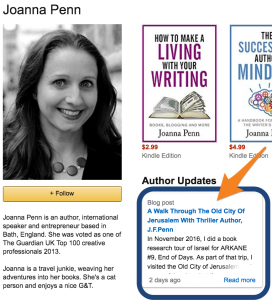 Joanna Penn’s page shows she is on top of it with her blog updates automatically synced to her Author Page. Next to “Blogs” on the Profile tab, click Add blog. Enter the feed address for your blog then click Add. Note: Make sure you enter the feed address, not the blog address. 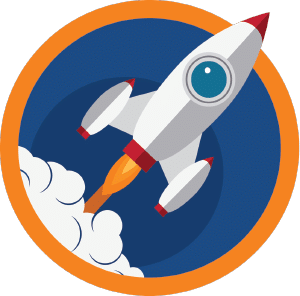 If you use WordPress, add /feed/ to your blog’s URL. For example, if your blog is named WackyWriter, and is at http://wackywriter.wordpress.com, your feed address would be http://wackywriter.wordpress.com/feed/. For more help with this step, Amazon has a post that will help. Having a book video or author video can definitely kick your Author Page up a notch and make it look more authoritative and legit! You can upload up to eight videos and choose the order they appear on your page. There are three big rules to follow. Your video must be less than 10 minutes long; in one of these formats: avi, wmv, flv, mov, or mpg; and smaller than 500 MB. There are more video guidelines, like don’t use distasteful or obscene content, but I hope that goes without being said. Check out Chandler Bolt’s author page, the guy who’s leading in self-publishing, to see his video in action. On the Author Central Profile tab, click Add video. Click Browse and choose your video. When it’s ready, review and approve your video. Check the box that you’ve reviewed the video, then click Approve video. 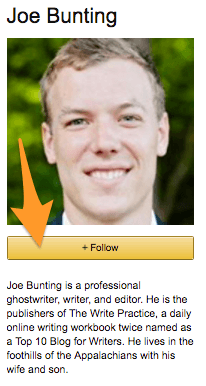 The yellow +Follow button should be on your Author Page by default, unless you’ve changed your settings. This follow button lets those who are interested in your work get updates when you’ve released new products or made big announcements. Only your biggest fans will probably click the +Follow button, but what’s better than your avatar (aka target audience) showing their eagerness to know the second you’ve released a new product on Amazon? This is one of those things to check is working right on your profile when you review your final Author Page. As if that’s not enough, there’s even MORE you can do within Author Central after your Author Page is setup. Make sure you have all versions of your books. Past editions. Audio. Kindle Edition. Paperback. Hardcover….If any titles or versions are missing, it’s easy to fix this and claim your books. Make sure every version of your book is linked to in your Author Central Profile, including ebooks, audiobooks, paperback, and hardcover books. In the search bar, type your author name, book title, or ISBN, and click Go. Once you’ve found the missing title, click This is my book below the book. If Amazon lists your name as the author, you’re done. If your name is misspelled or you’re not listed as an author, you’ll have to do a little troubleshooting here to get the book on your author central page. If you write under a pen name, like Dave does, click let us know under the “Do you have a pen name” heading. Amazon asks what your pen name is, then they contact the book publisher to verify you as author. Once you’re verified, you can access your pen name through the link in the upper right corner of Author Central. You can have up to three Author Pages with different pen names, and they will not be associated with one another on Amazon in any way. If you are a co-author of any book, listen up. There are not shared author pages, rather, each page is for an individual. So each author listed as a contributor to a book can claim the book under their account. You can reference and give a link to each other’s Author Pages in your biography or a blog post to share the love. Here’s an example from co-authors S.J. Scott and Barrie Davenport. Both their names are hyperlinked, which means they’ve both claimed this book. Sometimes you will see only one author’s name hyperlinked, which means the other author is missing out on the marketing potential of that product…#AuthorFail! You can add your Amazon Page URL to your author email signature, your website, or your social media. 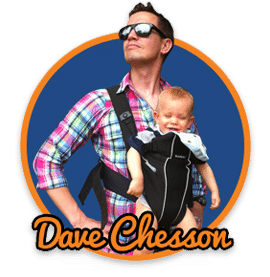 You might want to customize your URL with something that looks more professional, such as www.amazon.com/author/dave-chesson instead of www.amazon.com/author/dave-chesson/c/W9G3J/b?Q_1Nj/3k-1. This can create even more opportunities to get potential fans directly to your Amazon page filled with your Amazon books. If the URL you typed is available, click Save. Creating an editorial review for your book is ONE OF THE BEST TACTICS for your Amazon book sales page — yet so many authors don’t even take advantage of it. When Dave Chesson added an editorial review like the example below, he saw an immediate increase in book sales. And once you see the strategy behind it, you’ll understand why it works so well. The editorial review section is a place on your book’s sales page where you can list up to five reviews, comments, or testimonials that others have said about you, your book, or even your previous books. How incredible is that for book marketing? Here’s an example of a GREAT editorial review for Pat Flynn’s Will It Fly book. Notice how he bolded the names of the reviewers…this is because Pat wants to highlight the legitimacy of his writing. You may not know Pat Flynn of Smart Passive Income (although you really should), but there’s a chance you might know Michael Hyatt, Chris Guillebeau, Chris Ducker, etc. So, when you’re scrolling through his book’s sale page, and you see a comment by another author you admire, it’s instant legitimacy for Pat by proxy. Now, you may not be friends with people like Dan Miller and Josh Shipp to include in your editorial reviews, but that doesn’t mean you can’t start building author relationships with those in your genre or niche – and I HIGHLY recommend you do. Click the Books tab at the top of the page. Click on the book you want and select the correct edition (each edition is updated separately). Under Editorial Reviews, click Add. Follow the instructions to enter the review, the name of who wrote the review, and the name of the publication, website, or forum the review was received. If you are entering From the Author, From the Inside Flap, From the Back Cover, or About the Author, you don’t need to enter a source. Click Preview and Save changes when you’re happy with the review. Once you have your professional Author Page set, don’t forget to setup and optimize your page for international markets. You could miss out on heaps of sales if you ignore the international book market. There are 13 Amazon markets worldwide. Not all of them have Author Central yet, but there are at least four, in addition to the U.S. Amazon site. Visit the sites below, translate (if you’re using a Chrome browser, there’s a translate option at the top of the page), and repeat the steps above starting with setting up your Author Central account. 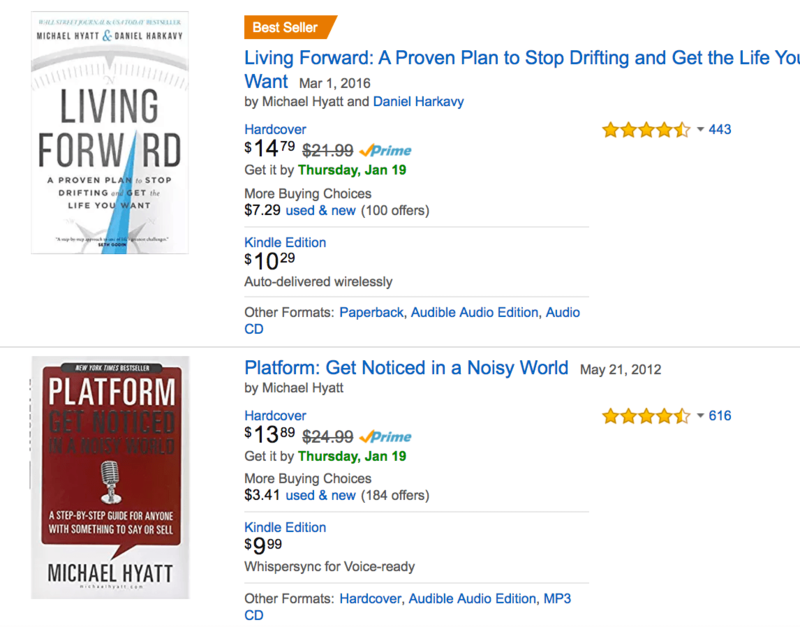 Everything about his page is aligned and represents the admirable author brand and platform he’s built at michaelhyatt.com. His bio mentions the books he’s written, the bestseller status and accolades he’s achieved, his experience working in traditional publishing, his impressive social media and blog following, the courses he created, where to find him on social media, and he even adds a personal touch about his family. All of these help sell his brand as someone you can trust and want to learn from. It’s no wonder he’s a virtual mentor to hundreds of thousands of people…Dave and I included! If you’re looking for an example, you should check out his Amazon page and learn about how he built his author platform in his books. Bonus: Don’t forget to download our free printable checklist to creating the perfect Author Central Page. There you have it, folks, a detailed summary of the most important features in Amazon Central and everything you need to create a professional Author Page. Having a polished and complete page in Amazon Central will help those who like what you have to say easily find other books you’ve written (or will write), have more fans on social media, drive more traffic to your website, increase your Amazon Best Seller Rank, and create more lifelong fans of your products and brand. And the best part? We’ve broken it down for you into an easy step-by-step guide. If you don’t already have an awesome Amazon Author Page, what are you waiting for? Bonus: You can download our printable Amazon Central Author Page builder checklist and use it whenever you want! If you have an Author Page already, post a link to your Amazon Author Page below in the comments so we can see what others are doing to spice up their author page. Val is the founder of Keep Calm Write On and The Common Cents Club. 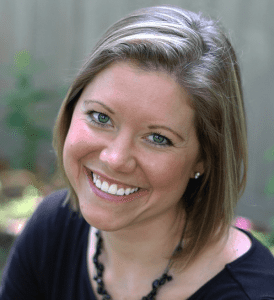 When Dave isn’t assigning Star Wars movies to watch for “research,” she spends her days sipping coffee, editing blogs and books, revamping Author Pages, and writing about the best frugal living tips. She likes to keep things simple while helping authors and online entrepreneurs keep calm as she makes their words shine, and leaves the mistakes behind. You can get in touch with Val to rehab your Author Page or polish your book or blog at Keep Calm Write On.